SOULcircles are held fortnightly for two-and-a-half hours on weekend afternoons during the school term. Each SOULcircle meets at a local community venue, and the programmes are led by a Programme Leader assisted by one or two volunteers. 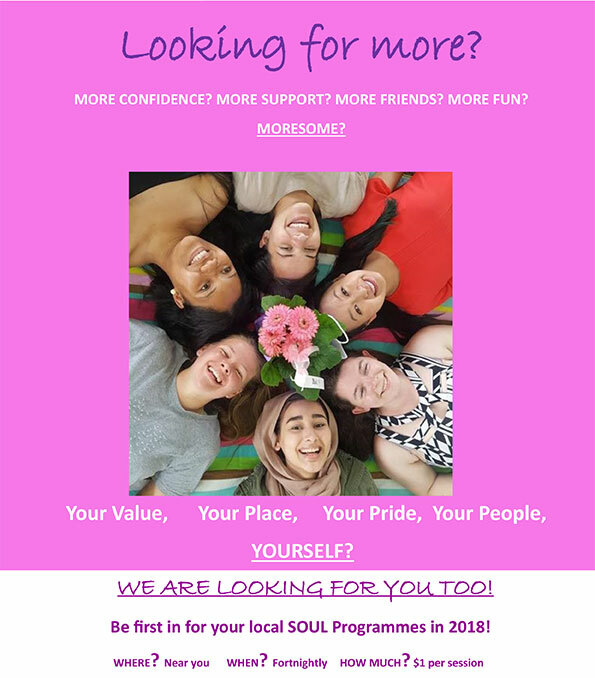 If you'd like to join a SOULcircle, we'd love to see you there! The cost is $1 per session. We request $5 per term at the time of registration. Participating girls are invited to join a private Facebook group for their SOUL circle. They can stay in touch, ask questions, and post topics for discussion. The Programme Leader posts inspirational and motivational quotes, along with updates on activities. SOULcircles are limited to ten girls. Reserve your spot today and transform the world for girls! In SOUL programmes, girls form friendships of trust they didn’t think possible, find confidence they didn’t realise they lacked and make life choices they previously never dreamt of; in short, they find the power to be themselves. Step 1: Register your interest and secure your spot in either the Takapuna or Newmarket Circle by clicking the button above. Step 2: Fill out and return the registration form we send you. Step 4: Join your SOULsistas and begin your journey!